Gardens designed to attract and nurture butterflies are becoming more and more popular in our area because they are not only beautiful, but contribute to the health and well-being of one of our very important pollinators. Butterfly gardens also give us an opportunity to provide a fun and educational family activity. There is an impressive list of annual and perennial plants that provide food and nectar that support the butterfly population. Based on performance in our local landscapes here are some of the most popular butterfly plants including zinnias, mistflower, porter weed and milkweed. All zinnias will provide a nectar source for butterflies such as the swallowtails and monarchs in the Central Texas Landscape. Old-fashioned zinnias like California Giant and Cactus can be grown from seed. Other hybrids like Dreamland and Profusion are available as transplants. They not only provide nectar for the butterflies, but goldfinches, doves, cardinals and other seed eating birds will appreciate the food source. Mistflower is a Texas native wildflower that is a huge butterfly attracting plant. Mistflower produces powdery looking blue flowers on a formless mound that grows to about 2 feet tall. Porter weed is a little harder to find all-star butterfly attracting plant. The stems have small lengths of brightly colored red or purple blooms that are a potent nectar source for butterflies. Red porter weed is a dwarf variety that can grow to 2 feet tall and purple porter weed grows to 4 feet tall. 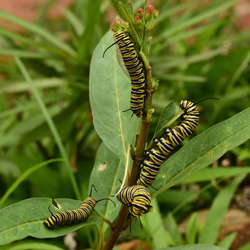 In addition to being a popular nectar plant for monarchs, queens, gulf fritillaries and other species, the milkweeds are the only genus of plants that monarchs will use for egg laying. There are tropical milkweeds and several varieties of native milkweeds, all of which provides nectar and egg-laying sites for monarchs. 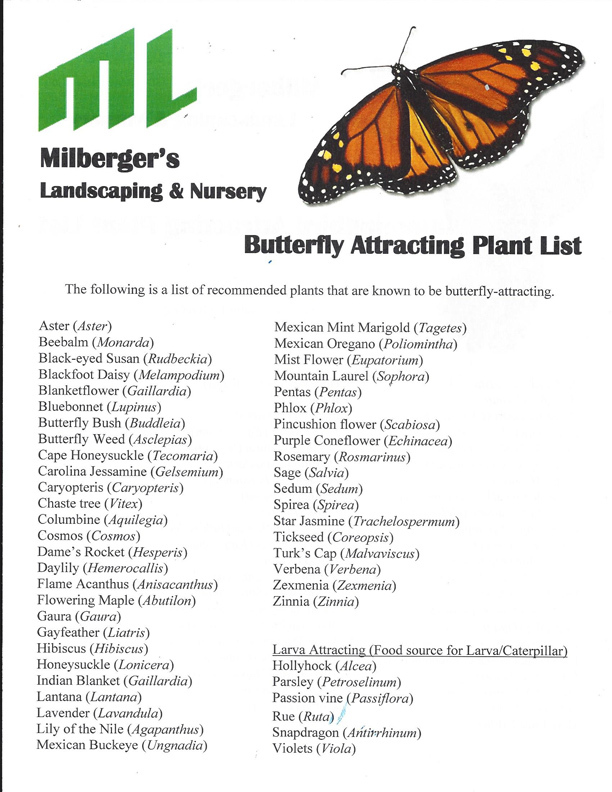 Visit Milberger Landscape nursery to view our sample of butterfly gardening certified by the North American Butterfly Association. Background - On June 24, a group of 20 volunteers planted a Hummingbird and Butterfly Garden at a residence near the Medical Center. The garden was an item from an internet auction organized to raise funds to support completion of an Education Resource Center for the neighborhood to house their intergenerational education program and other neighborhood activities. Most of the volunteers were Gardening Volunteers of South Texas (GVST) members but the group included Bexar County Master Gardeners, neighbors, and other individuals wanting to help, and to also learn about water conservation and butterfly gardening by participating. Businesses led by Quality Organic Supply, Milberger’s Nursery, Fanick’s Nursery and Green Grass Inc. provided the compost, mulch, plants and other materials for the garden. Plant Selection - The garden is approximately 625 sq.ft. The garden includes blooming plants that will provide nectar 12 months of the year and includes plants required by monarchs, gulf fritillaries, giant swallowtails and other butterfly varieties that only lay their eggs on certain plants. Most of the plants are perennials but some are annuals. Plants were also selected so that there was good representation in the winter and that the garden personality would change as the seasons progress. Soil Preparation - The native soil is rocky and compacted. The limited weed cover included horseherb and Bermuda grass. It was sprayed with glyphosate with the expectation that the killed weeds would become part of the mulch layer. Three inches of compost was applied over the whole garden. Thirty lbs. of slow release lawn fertilizer (19-5-9) was spread over the planting area as well. In future years 15lbs of the same fertilizer can be applied every year. Plant Placement - The garden is heavily planted. By the end of the first season it will be crowded with plants. In future years you may want to transplant some of the excess plants or expand the gardens boundaries. Zinnia Flower Garden - Forty sq. ft. of the garden was designated for zinnias because of their colorful display, popularity as a nectar source, and inclination to reseed. The area was tilled to incorporate the compost and native soil. For immediate color Dreamland and Medium Mix transplants were planted on one ft. squares. California Giant zinnias were seeded in the bed along with the transplants with the expectation that they would eventually dominate the bed by reseeding. The main issue with the zinnia bed is watering. Zinnias respond well to the heat but are not xeriscape plants. Watering twice per week for 1 hour with the leaky hose works well if there is no rain. Some weeding may also be required, especially until the California Giants become the dominant flower and shade out the weeds. In the winter the zinnias will have to be replaced with winter blooming annuals such and calendulas and stocks. They are attractive and provide nectar for the winter butterflies. Other Nectar Producing Annuals - One of the most interesting plants in the garden is the dwarf porter weed. It bears short pieces of bright red bloom on weeping stalks from a mound that grows to about 2.5 feet tall. The nectar is a favorite of butterflies and hummingbirds because of its reported nutritional potency. The porter weed will have to be replanted each spring. Vines - Crossvine was planted because it is often the first plant that the spring migrant hummingbirds visit for nectar. Passion vines were planted at the opposite ends of a small trellis. They produce attractive blooms but more importantly, they are the favorite egg-laying site for gulf fritillary butterflies. Mexican flame vine was planted as a late summer/fall nectar source. Additional or larger trellises can be provided for these vines if you want to expand their growth area. The current situation will require some pruning to control their range. The limited trellis area will provide the hummingbird and butterfly impact desired but all of the vines are attractive and can be grown larger. Milkweeds - Two types of milkweed were planted in the garden. Milkweeds are required for Monarchs to lay their eggs. The monarchs will lay eggs on the milkweeds in April on their way from the Mexican wintering grounds to Central North America. During the summer queen butterflies lay eggs on the milkweed. In addition to being the required egg-laying site for monarchs and queen butterflies, milkweed are popular nectar sources. The tropical milkweed usually has an orange and yellow bloom. It grows to 4 feet tall. The native A. tuberosa milkweed only grows about 10 inches tall. It produces an orange or yellow bloom. A. tuberosa dies back in the winter but the roots are hardy. Tropical milkweed stems and foliage may survive a mild winter but it is recommended that it be cut back to the ground after the monarchs leave on their way south in October. 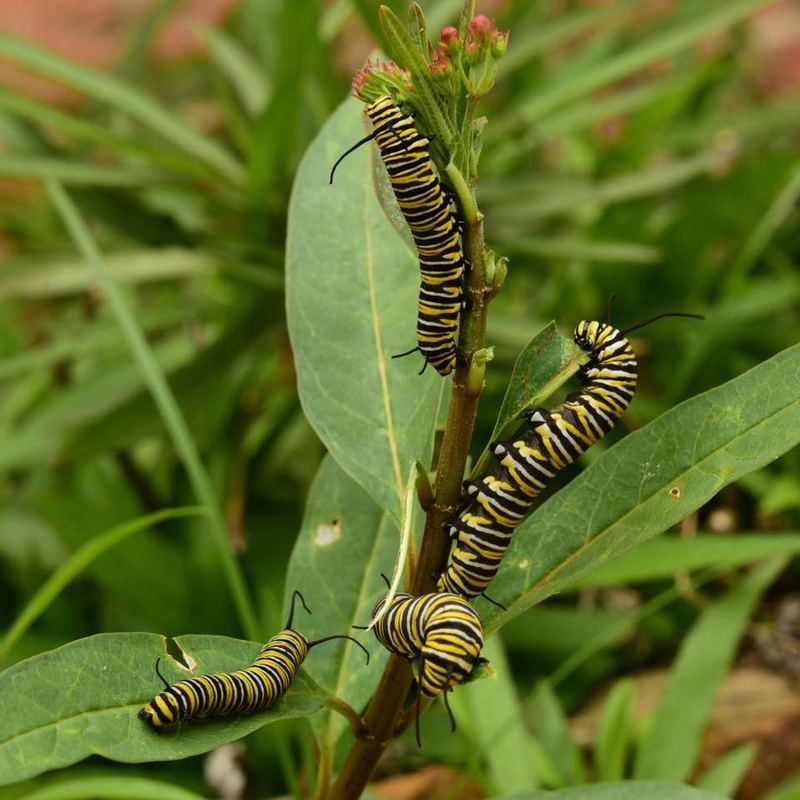 The pruning helps address the issue of whether the exotic tropical milkweed encourages the Monarchs to stay in San Antonio over the winter and/or whether detrimental microorganism populations accumulate on overwintering tops. Research results are not definitive that there is any negative impact. Gregg’s Mistflower - Mistflower rates very high on everyone’s nectar producing plant list. The sprawly 2 feet tall plants will be covered with swallowtails, monarchs, painted ladies, bordered patch, queens and other butterfly species until cold weather arrives in November. The plant dies back for the winter and resprouts in late spring. Duranta - This large weeping plant becomes covered with purple crinkly blooms from mid-summer until late fall. In the autumn you can expect it to also be covered with monarchs, queens, and gulf fritillaries. The woody stems are killed by the cold temperatures most winters so it does require some pruning in the spring just as poinciana, firebush, lantana, blue salvias, rock rose, mint marigold and esperanza. Evergreen Plants - To insure some winter green several species of plants were distributed or planted in drifts in the garden. Dwarf Mexican petunia, daylily, iris, gulf muhly grass, glossy abelia, and Salvia greggii were planted. Some of the evergreen plants also provide nectar or egg-laying sites. Most winters blue plumbago stems and foliage will survive the cold. In some mild winters they may even bloom most of the season. Other Egg-laying Plants - In addition to milkweeds and passion vine other plants that are favorite or required egg-laying sites for butterfly species. Two citrus trees will attract giant swallowtails; cannas are the egg-laying site of Brazilian skippers; flame acanthus are the favorite egg-laying site for janais patch; and shrimp plant for Texan crescentspot. Special Plants for Hummingbirds - Some gardeners use cape honeysuckle as a fall blooming vine but in this garden the long reaching stems will have to be pruned back to maintain a shrub. The small red trumpet shaped blooms last from July to the cold weather arrives. Cape honeysuckle freezes back to the ground. Fire bush also freezes back to the ground after a summer and fall of blooms. Mexican honeysuckle produces orange blooms on a large shrub that the deer do not eat. Other Plants - The landscape that hosts the Butterfly and Hummingbird Garden and the surrounding neighborhood is well planted with hibiscus, roses, sunflowers, wildflowers, horseherb, brugmansia, shade trees, Mexican olive, and other plants, many of which are attractive to the hummingbirds and butterflies. They were considered in putting the plant list together for the garden and will complement the plants in the new garden.